May 15, 2019: Deligation:Solidarity with Nicaragua! focus: To show the love, concern, and compassion that people of faith have for immigrants who are suffering under the harsh policies of ICE. Please join us each Thursday at 4pm! All people of faith and conscience are welcome! A group of clergy—Islamic, Jewish, Christian, other-- and others concerned for immigrants in our community are organizing weekly interfaith prayer vigils at the Immigration, Customs & Enforcement (ICE) office on Thursday afternoons. At these vigils we pray, sing, hold silence, lift up prophetic values of justice and compassion, and exhort those in power to work from that set of values. Each week in prayer, we name the reality of families being separated by immigration practices. We pray that God’s intervention, power, grace, and comfort enter into these situations of suffering and despair. Leaders and members of Islamic, Jewish, and Christian faith congregations gathered last fall and talked about what kind of public presence they would want to do together. The weekly vigils began the following week: to bear witness to inhumane treatment being perpetrated on many immigrant communities, and to hold them in the light of hope. We are fortunate to find many neighbors around Cleveland who share our belief that faithfulness requires prophetic action in situations where abuse of power and great suffering exist. Joining together in these weekly vigils is a step of prophetic faith witness. Please join us each Thursday if you are able. Your presence matters! Come join us for a Fair Trade Sale the weekend following Easter! Free Raffles at the door! Fair trade is an institutional arrangement designed to help producers in developing countries achieve better trading conditions. Members of the fair trade movement advocate the payment of higher prices to exporters, as well as improved social and environmental standards. Read more about fair trade here . Like and follow Ohio Fair Trade Network on Facebook . Station Hope is a jubilant community event celebrating Cleveland's social justice history and exploring contemporary struggles for freedom and equity. Engage with over 250 artists as they envision, interrogate, and seek out hope on the grounds of Cleveland's first authenticated Underground Railroad site, St. John's Episcopal Church. Audiences explore the historic properties while viewing works of theatre, music, storytelling, and dance inspired by the most important issues of our time. IRTF will be one of several community partners represented at the Activate Hope table, to connect attendees to opportunities for advancing social justice causes throughout the Cleveland area. To volunteer at the IRTF outreach table, please call 216.961.0003 or email volunteer@irtfcleveland.org . Read more about the event here . Cleveland Public Theatre (CPT) mission: producing adventurous and unconventional new work for the stage; supporting local artists; and undertaking important education programs that use theatre to change lives. CPT's projects include Teatro Públic Cleveland (Spanish-language theatre) and Masrah Cleveland Al-Arabi (Arabic language theatre). Like and follow Cleveland Public Theatre on Facebook. Please consider volunteering for our annual phonathon to contact IRTF supporters. If you can't stay the whole time, come for just 90 minutes or so. We only call people on our mailing list who are already supportive of our human rights work. We mostly leave voicemail messages. We provide refreshments and good company. To volunteer, please come to the office any of the hours listed above*. Please bring your cell phone (if you have unlimited minutes) to make calls, or use one of our three phone lines. If you would like to bring a snack to share, that would be welcome, too. Meet our board members; they’ll be here on the phones! *Volunteers are also needed during the daytime MON-TUE-WED for clerical work in the office. The InterReligious Task Force on Central America invites the public to our annual Latin Dance Gala on Saturday, May 11, 2019. Enjoy free dance lessons and performances. We will celebrate right in our own neighborhood at Franklin Circle Church hall (1688 Fulton Rd Cleveland, OH 44113). Don’t miss out! Wine & beer available. Donation requested. Non-alcoholic beverages and food are complimentary. Sponsors needed: Sponsorship packages are available from $100-$1000. To become a sponsor, choose your sponsorship level on the event site, or email us at promotions@irtfcleveland.org . Tickets: Mail $20 to IRTF, 3606 Bridge Ave., Cleveland OH 44113 by May 9. Or purchase on the event site (which will charge a processing fee). Discount tickets of $10 also available for open dancing, 9:30-11:30pm only (i.e., you'd miss the free dance lessons and performance, as well as the food). Tickets at the door are $5 more. Questions: 216 961 0003 or promotions@irtfcleveland.org . We're excited have jazz-great Alex Bevan (Cleveland Federation of Musicians Local 4) as our M.C. this year. First known as "The Skinny Little Boy" from Cleveland, Alex will provide entertainment during the cocktail hour, and will then emcee the program. Rollie Dreussi, Executive Secretary, Northeast Ohio Newspaper Guild - CWA, Local 1, will talk about one of the local labor fights that has been ongoing over the last couple of years in Cleveland. During the Poor People's Moral Action Congress, we will launch the Poor People’s Campaign Moral and Constitutional Budget, hold a National Freedom School, and invite Presidential candidates for a forum on our demands and budget. We plan to visit Capitol Hill during the Congress and have requested a hearing at Congress. The IRTF will be taking a delegation to the PPC Moral Action Congress. If you are interested in traveling with us to the Congress, please contact Chrissy Stonebraker-Martinez. 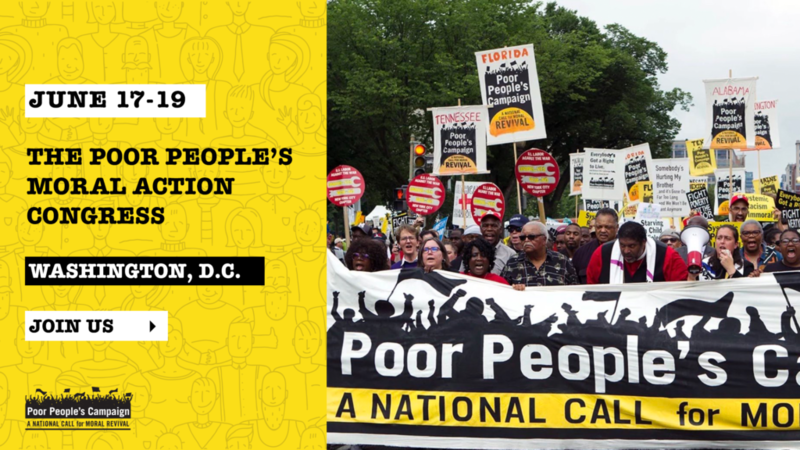 For more information regarding the Congress, visit the Poor People's Moral Action Congress site or on their Facebook page. We hope to see you there. To learn more about the movement, visit the webpages for Poor People's Campaign, Organize Ohio's End Poverty Now campaign, and Ohio Poor People's Campaign web pages. Equal Exchange has hosted an annual gathering bringing together worker-owners, farmer partners and you! We believe you are an integral part of this movement and need your participation to succeed. Join our community for two days of workshops, celebration, and planning as we advance our vision of building a better food system, together. The IRTF will be taking a delegation to the EE Summit. If you are interested in traveling with us to the Congress, please contact Chrissy Stonebraker-Martinez. For more information regarding the Summit- including an informational webinar and a bio of the Keynote Speaker, Santiago Paz López- visit the 2019 Annual Equal Exchange Summit site page or their event Facebook page. We hope to see you there. For more information and access to the application process, visit the CPT webpage for Delegations to Colombia. IRTF will not be traveling with this delegation but we greatly appreciate the work of CPT and are happy to promote this opportunity to you, our community.